WASHINGTON (CNS) — America still loves a good TV game show, as “The American Bible Challenge” has demonstrated. It’s the highest-rated program on cable’s Game Show Network, which specializes in this kind of thing. 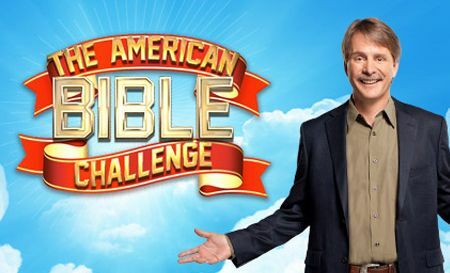 The third season of “The American Bible Challenge” premieres May 22 on GSN. The first season featured a team of nuns coming close to winning the season championship. This season, the show will feature a three-man team of motorcycle-riding priests, appropriately named the Sons of Thunder. Under the show’s format, each three-member team has to play against two other teams to test their Bible knowledge. Each week’s winner — there are nine weeks of games in all — goes to a three-episode semifinal round, with the three winners who emerge from that heat vying for the championship. The winnings increase in each round, and the cash goes to the team’s favorite charity — oftentimes a ministry in which they are involved. Host Jeff Foxworthy, who was raised a Southern Baptist but who now attends a nondenominational church in the Atlanta area, said he initially shied away from the prospect of hosting the show. More visits to those ministries will be part of the third season, he said. Foxworthy said he asked her if something was wrong. She replied, “Do you know what $25,000 can provide? That’s 80,000 meals.” “It’s not like people were getting their kitchen remodeled or buying a new car,” he added. A new element will be a segment called “Christ or Klingon?” During the segment, a word is spoken to contestants, who have to determine whether the word comes from the one of books of the Bible or from one of the versions of “Star Trek.” Award-winning gospel singer Kirk Franklin was brought in at the start of the second season to be Foxworthy’s musical co-host. Once he agreed to host the show, he said, “I knew I’d get some grief. Not from the secular community but from someone in the religious community” with a set notion about how — or whether — such a show could be done. Much to his gratification, Foxworthy added, no such negative feedback made its way to him.